I do quite a bit of cooking and baking so I often get tired out at the end of a long day standing and preparing food for my family. WellnessMats came to my rescue with the most comfortable anti-fatigue mat that I have ever had the pleasure to stand upon. Designed to promote proper circulation and reduce fatigue, WellnessMats also encourages “better posture, muscle conditioning and improved overall health for anyone who stands for longer than 20 minutes”. In my experience, it delivers on its promise because I actually look forward to standing on it while doing all of my prep-work, cutting, cooking and baking as well as the dreaded kitchen clean-up. I was initially a bit skeptical that it would be of benefit to me however I was so pleasantly surprised that I did not have any leg fatigue or lower back aches even after baking all afternoon. It provides extra support for the knees, hips, back and feet. 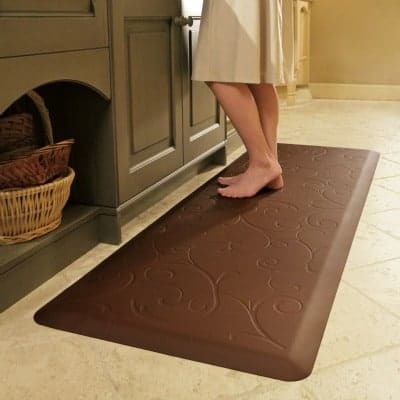 I learned that the Wellness Mat is loved by professional chefs such as Sara Mouton and Mario Batali and without a doubt it is essential in my home kitchen. In fact, my husband commented that standing on this mat was so comfortable that we should get a few more to place throughout the house including the bathroom and foyer. I especially love that the Wellness Mat is safe and non-toxic with no PVC’s so it won’t be a potential trigger for my daughter’s asthma. It is designed to be anti-microbial and is both stain and dirt resistant. I simply wipe it down with a cloth as needed for cleaning and it looks as good as new. I also appreciate that it has beveled edges so I don’t have to worry about tripping over it like I have in the past with other brand mats. 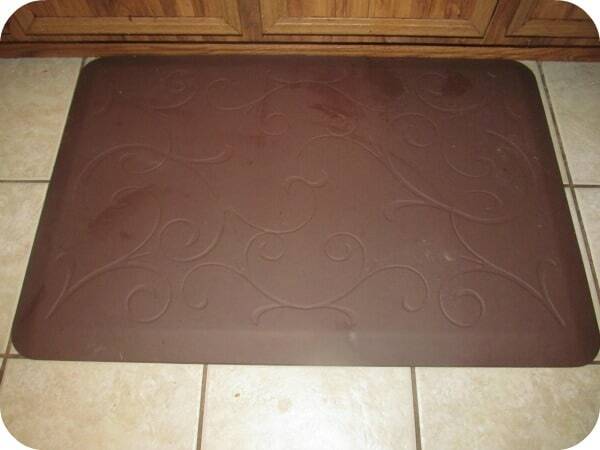 It also promises that the edges will never curl so this mat is sure to be in our kitchen for a long time! There is a wide selection of attractive designs, colors and sizes available at WellnessMats and you can choose your favorite anti-fatigue mat. You can select from the PuzzlePiece or Motif collections and be assured that you are getting the ultimate comfort mat that is stylish and made of the highest quality, durable materials. I really like that you can even choose a Decorative Mat Cover such as the “Seasons” to change the look of your WellnessMat to fit the time of year or your home décor. You can purchase the WellnessMat online or at retailers nationwide such as Williams Sonoma or Sur la Table. Even better, your WellnessMat includes a seven year warranty! You can purchase the 3’ by 2’ for only $119.95 or the 6’ by 2’ for $239.95. Additional sizes are also available. You are invited to visit WellnessMats website to browse the entire collection, learn more about this excellent product line and shop for your favorite anti-fatigue mat. Which one do you like best? I like the black with the bella design. I like the Motif in Brown. ooohh this is lovely..would love the chocolate brown long one..its great..thanks for the contest,. I like the brown motif as well.. I like the Motif Collection – Bella design in burgundy. I have a green kitchen. so the couture-celadon would be great. My favorite is the Brown Motif. I like the motif mat in tan. Thanks for the chance. I like the seasons collection! I like the Bella Motif in burgundy! My favorite is the Motif Collection. I like the Bella motif in Tan color. I like the Seasons Decorative Mat Covers. i love the cantera mocha ! I like the Cantera Mocha design. I like the Bella Motif. i like the motif collection! Bella. Thanks for the giveaway.